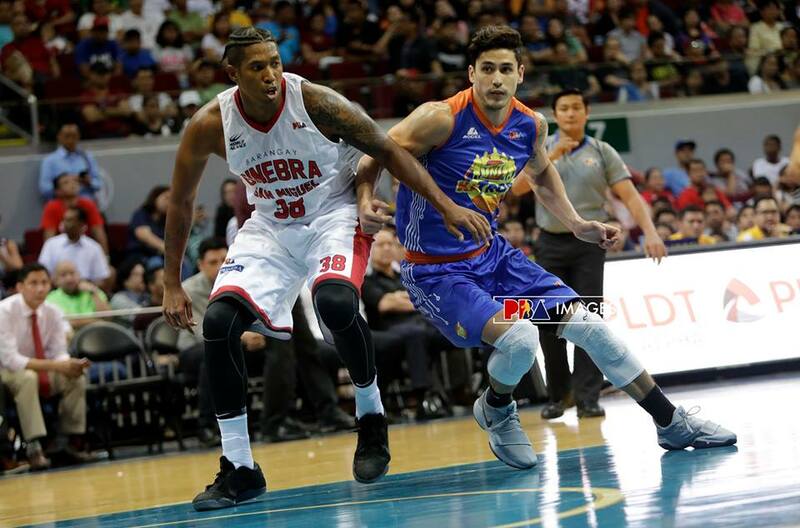 MANILA, Philippines - Barangay Ginebra is now on the verge of elimination after losing anew in the hands of unlikely hero Anthony Semerad and TNT Katropa, 107-103, on Tuesday, June 13 at the Mall of Asia Arena. Coach Nash Racela used his game 1 starters where Moala Tautuaa manned the middle to start the first quarter in a blitzing manner. Barangay Ginebra, downed by 0-1 in the series, drew an inspiration from the 90’s-Robert Jaworski-Bal David era by sporting the “Ginebra Na!” retro jersey and targeted to get even with TNT katropa in game number 2. Compared to the previous game, Ginebra looked sharper and went ahead of TNT in the early phase of the opening quarter. Behind by 6, Coach Racela sensed the urgency to bring Joshua Smith in for inside presence and offensive onslaught. Smith quickly dropped 5 points and gave Japeth Aguilar his 2 personal fouls. Aside from the retro jersey, “Mr. Flash” Bal David himself was inside the arena to physically cheer for his team and inspire the Barangay even more. With Bal David’s presence, modern day successor LA Tenorio proved that he’s worthy to carry on David’s legacy by leading his team with almost double figures with 9 at the end of the first, 26-22. TNT finally caught up at the start of the 2nd quarter with Kris Rosales’ 2 three pointers but Japeth Aguilar was too prompt to react and grabbed the lead back to Ginebra’s side with an and one. It was a low scoring ballgame for both teams. With 6 more minutes left in the half, the scoreboard got stuck at 38 all for quite some time until Joshua Smith and Japeth Aguilar broke the ice. Still in a deadlock though. At the end of the first half, Ginebra managed to bring a slim 3-point lead, 56-59. LA Tenorio led all scorers with 14 points while Joshua Smith’s 9 topped all TNT players after 28 minutes of basketball. Ginebra sustained their lead where 4 of its players were in double figures already. Tenorio still led all of them with 17 followed by Justin Brownlee with 15. Despite having a shorter line-up, Ginebra managed to get the boards 33 to 27 versus TNT and the reason why they were up in points. Under 3 minutes, Ryan Reyes dropped a long bomb and stole the lead from Ginebra but Japeth Aguilar once again reclaimed their lead with a dunk from the middle and ended the third quarter 85-84. Joshua Smith who erupted for 35 points in game 1 barely made it into the double-digit with 13. Coach Tim Cone has definitely figured out on how to defend the monster-import. He only made 4 baskets under the sticky defense of Japeth Aguilar, Joe Devance and Dave Marcelo. Coach Racela had to sit Smith to cool him up in preparation for the crunch time. As TNT was making a run, Ranidel De Ocampo was whistled for a technical foul after accidentally tripping Justin Brownlee. De Ocampo had to sit on the bench for 5 minutes. Joshua Smith cut his rest short to replace De Ocampo and continue their run. Anthony Semerad, the most underrated forward in the league, sank three treys and gave TNT a 102-100 lead with 3:31 left in the final period. This game had at least 15 lead changes that thrilled the fans in the arena. The entire MOA arena shook after LA Tenorio hit a three pointer and swung the lead to their end. But guess what? Anthony Semerad countered La Tenorio’s long shot with a version of his own. With that 3, Semerad recorded his 14th point with 3 for 4 from the outside. TNT led Ginebra by 2 points with 10 more ticks left. Joshua Smith added 2 more points for a 2-possession lead with 8.1 remaining in the ballgame. Justin Brownlee took the last shot for Ginebra but widely missed from the three point area. Game 2 was wrapped up with TNT gaining a 2-0 series lead. Anthony Semerad, TNT’s game 2 hero was cited as the Best Player of the Game with 14 points. TNT Katropa will try to shut Ginebra in game number 3 and take the first finals seat on Thursday at the Smart Araneta Coliseum at 7pm. Quarter Scores: 22-26, 56-59, 84-85, 107-103.